Since I became a customer of Zecco Trading three years ago in 2007, I have seen Zecco made many changes, to both its website and the products it offers. For most of the time, however, I wasn’t that impressed by the change, until I saw its latest invention, Zap Trade, which I think is probably the coolest tool the online discount broker has ever made as far as I can tell. 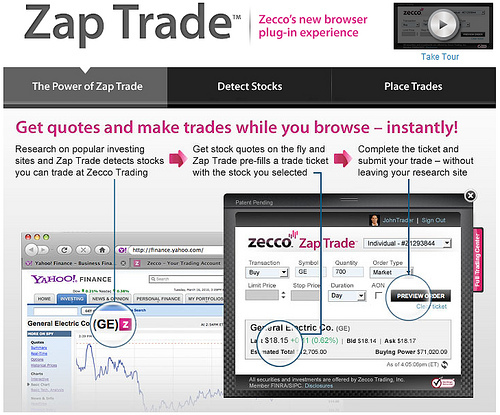 I got an email from Zecco yesterday with the announcement that it has just launched a new trading tool, Zecco Zap Trade, a Firefox plug-in that lets Zecco customers get quotes and trade stocks anywhere on the web. After downloading and installing the add-on for Firefox browser, a small icon for Zap Trade appears in the browser’s status bar. If you are a Zecco customer, you can click on the icon to enter your user name and password to log into your account (Of course, you need to be a Zecco customer to use Zap Trade). Zap Trade can then detects stock symbols in financial websites such as Yahoo Finance, Google Finance, MarketWatch, Blookberg, etc and let users to trade the stock without having to got to Zecco website. I have installed the Zecco Zap Trade plug-in and I have to say I am quite impressed. 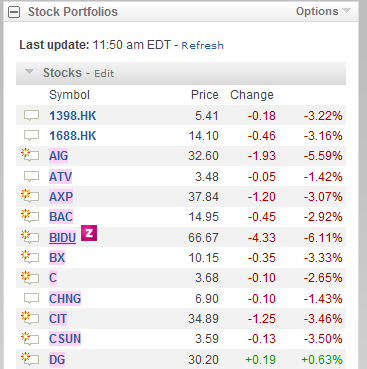 Once Zap Trade is running, it turns the background of stock symbols on web page (below is the my stock portfolios in My Yahoo) into pinkish color and an icon will appear on the right when mouse-over the symbol, indicating that trading of that stock is supported. After I clicked the icon, a Zecco Zap Trade window popped up to let me enter order information. The stock symbol and transaction (Buy) are pre-populated. All I need to put in are quantity, order type, etc. 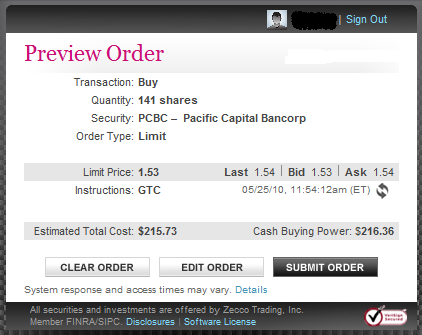 The pop-up window also shows real-time quote of the stock, as well as fund available in the account for trade. From the Zap Trade window, I can also refresh the screen to get updated quote. Before submitting my order, I will have a chance to preview it from the Zap Trade window to make sure the order is correct. 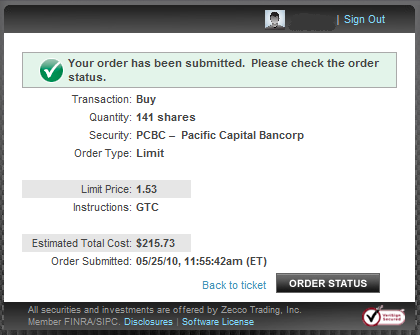 The final step of trading stock from Zap Trade is submit the order for processing. While everything from entering an order to submitting it for processing can be done within the Zap Trade window, I can only check the status of the order on the website, not from Zap Trade, even though no log in is required since I already logged in Zap Trade. While this isn’t really an issue, it would be nice if I can see the order status within Zap Trade. Though my experience with Zap Trade is very short, the impression it gives me is very positive so far. Being the first of its kind in the brokerage industry, Zap Trade is a great idea which really makes trading stocks with Zecco and getting real-time quotes very easy. Given past complains about Zecco’s website, Zap Trade allows customers to completely skip Zecco website (except checking order status) and make stock trades from anywhere on the web. Want to try Zap Trade? 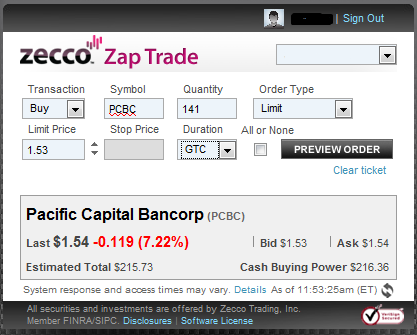 Download the Zecco Zap Trade plug-in for Firefox and experience it yourself (see my Zecco review post for details about the broker and how to open an account if you are not a customer yet). Should have made this tool a bit smarter. From a development standpoint, its quite easy to disable this thing from working on 3rd party quote sites. Shouldn’t be long before Zecco competitors write scripts to bring this app to a halt on their sites. Your clearly very smart but, is it really that easy to write a script to disable this feature? Please explain.